As most of you may know, Nick and I have known each other for over 7 years, and we’ve been dating for most of them. And you may also know that my birthday falls on New Year’s Eve, and this year (2010) I decided that I wanted to have a fancy party to celebrate my birthday and to ring in the new year. We had been talking about getting married for a while now, so I knew it was going to happen, just not so soon. (He had me believing that it would be at least another year so we could get our finances straight.) 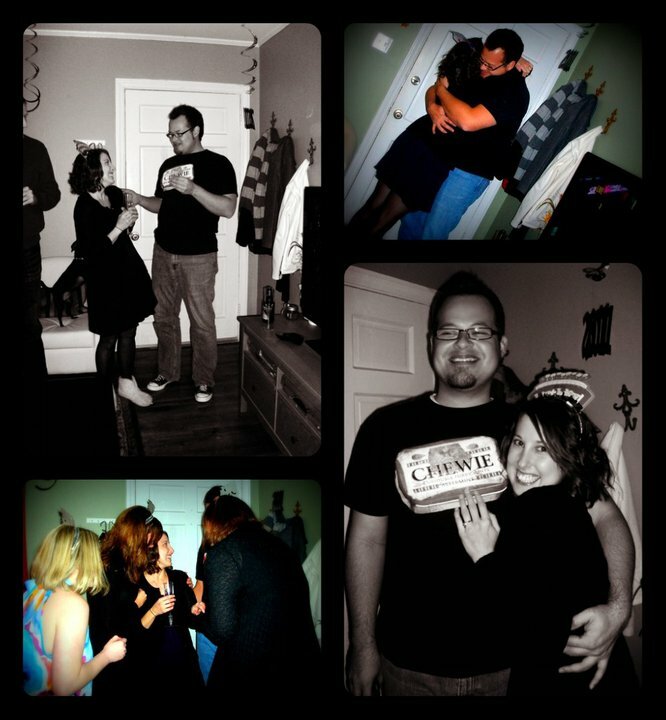 At midnight on NYE 2010, we watched the ball drop with about 15 of our closest friends. After the champagne toast and the New Year’s kiss, Nick made his announcement. He said that it was a night of many celebrations (my birthday, NYE, our friends’ wedding anniversary) and he wanted to add one more. He turned to me and said he was glad it wasn’t the first NYE/birthday celebration we’ve shared together and he wanted to share the rest of them with me for the rest of his life. He pulled out the beautiful ring from behind his back and said, “so I guess you know what this means!” I was smiling and laughing and extremely happy and my response was, “Okay!” We kissed and it was official. My friends were surprised and happy and excited. It was the best birthday ever! Special thanks to Sheena Latham for taking these photos that night! It’s vintage, from the 1920s-ish, and I love it! But the most fun part of it all is getting to blog about the process of planning a casual, fun, and comfortable wedding as well as reflecting on my life and my future and gushing about the man that I love with all of my heart! I’m hoping the planning goes smoothly to match the laid back style of the event. 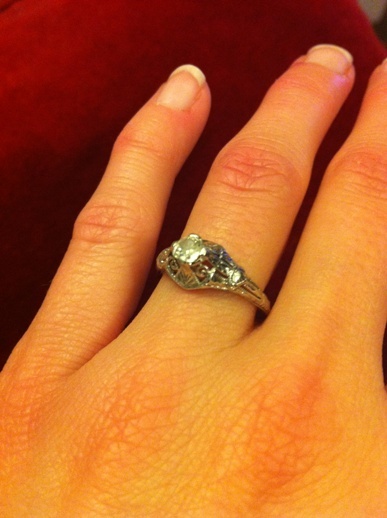 So stay tuned for wedding [planning] bliss!